Welcome to Renazco Racing, tailors of custom motorcycle seats. Factory motorcycle seats can be quite uncomfortable and while most of us are shaped and built differently, it's quite challenging for manufacturers to build a one size fits all seat. At Renazco Racing, we specialize in building seats that are ergonomically designed to fit you. 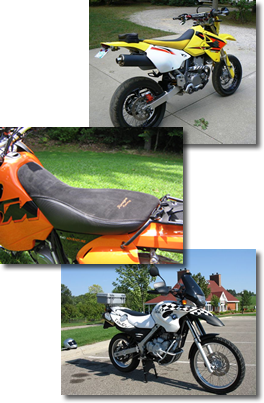 We have decades of riding experience and a vast knowledge of motorcycle ergonomics, and we're proud to offer custom hand sculpted motorcycle seats for Adventure, Dual Sport, Off-Road and Supermoto Bikes. Each seat we build is designed to fit you based on several different factors: height, weight, suspension, style of riding and the type of bike you ride are just some of the things we take into consideration. A well thought out combination of foams and materials are used to create a comfortable seat that will change the way your bike will feel. We welcome you to come in, take a look around and see some of our work. We're here to answer any questions you may have and look forward to working with you. It's true, we've opened our store! Renazco Racing is proud to announce the opening of our parts, accessories and apparel store, where we offer tremendous savings on the gear we most often recommend to our customers. New products are being added daily, with FREE continental US shipping on selected items! Come pay a visit at www.renazcoracing.com!